The only weapons of mass destruction that are currently not explicitly prohibited under international law are nuclear weapons. 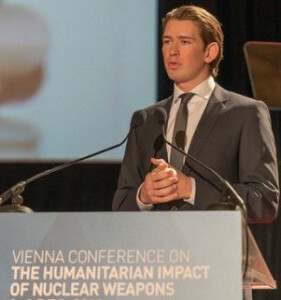 At the Vienna Conference on the Humanitarian Impact of Nuclear Weapons in December 2014, the Austrian foreign ministry delivered a pledge to “fill the legal gap for the prohibition and elimination of nuclear weapons” and “to cooperate with all stakeholders to achieve this goal”, calling on states to join this effort. Austria also pledged to work with states and relevant organisations “in efforts to stigmatise, prohibit and eliminate nuclear weapons in light of their unacceptable humanitarian consequences and associated risks”. This pledge offers a key opportunity and starting point from which to commence negotiations on a treaty banning nuclear weapons this year – a crucial step for the stigmatisation and elimination of nuclear weapons. Following the Vienna conference, Austria invited all states to support their pledge by distributing a diplomatic note verbale through its embassies. The pledge will be presented again with the list of states that have endorsed it at the Review Conference of the Non-Proliferation Treaty in April and May 2015. In January 2015 at the third annual summit of the Community of Latin American and Caribbean States (CELAC), heads of state of all 33 CELAC countries became the first to formally endorse the Austrian pledge in a declaration supporting the outcomes of the Vienna conference and the pledge. The region has a history of leadership in opposing nuclear weapons: the first multilateral treaty to prohibit nuclear weapons across a region was the Treaty of Tlatelolco, covering Latin America and the Caribbean. CELAC’s declaration “reiterate[s] our strong support to call made in Vienna and Nayarit to initiate a diplomatic negotiation process of an internationally legally binding instrument for the prohibition nuclear weapons” and notes that CELAC members “are committed to open negotiations, at the highest political level, for the prohibition and elimination of nuclear weapons through a legally binding instrument”. Over 50 states in total have now signed up to the pledge. As momentum builds towards the negotiation of a treaty banning nuclear weapons, Article 36 has been exploring what elements such a treaty should include. The Austrian pledge observed that despite “unacceptable harm that victims of nuclear weapons explosions and nuclear testing have experienced…the rights and needs of victims have not yet been adequately addressed”. 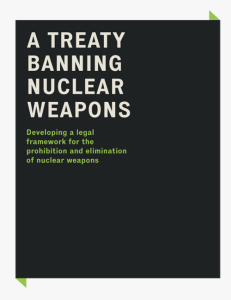 In our 2014 report with Reaching Critical Will, ‘A Treaty Banning Nuclear Weapons‘, we suggested that a ban treaty could articulate the responsibility of States Parties to ensure the fulfillment of the rights of victims of nuclear weapons and provide necessary assistance in this regard. Building on this, we recently released a new briefing paper to give an initial consideration to some of the issues around including victim assistance in a treaty banning nuclear weapons.